Socrates, clearly one to see the glass half full, noted that, "If you get a good wife, you will become very happy; if you get a bad one, you will become a philosopher—and that is good for every man." In other words, if you are less happy you will focus more on what constitutes a good life. I think that's somewhat true, in that ebullient moods are great for socializing but bad for thinking about difficult problems. Nothing focuses the mind like adversity of some sort. These are very deep questions from a 12-year-old, who was given everything he needed to live, but had no ability to connect or make an impact on anyone or anything. A life needs real achievement to matter. A week before he died, his mother touched his skin for the first time. secibd link (D.V. 's writing) not accessible. I wonder if the effect would be different now considering the interactivity afforded by the internet, etc. I.e. there are ways to connect or make an impact from inside a bubble. Unless this boy generalized his plight to normal people, i.e. that death negates all value of living, I don't think he was an Existentialist. 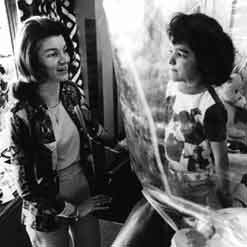 I vaguely remember the made-for-TV movie about this ("The Boy in the Plastic Bubble"), though if memory serves they gave the movie a happy ending. Is Capital a Cushion for Bad Times? Is Levitt's Abortion Study as Good as it Gets? Was Friedman Right on Markowitz?